This week's Sweet Melissa Sundays pick was for Goat Cheese, Olive and Thyme Muffins. I am not a huge fan of olives, thyme or savory muffins so I opted to do a rewind recipe this week. If Goat Cheese, Olive and Thyme Muffins sound good hop over to the Sweet Melissa Sundays site and see the results of those who baked along this week. Thanks to Hanaa for hosting! I chose a recipe from the Sweet Melissa Baking Book that was done by the group before I joined. Snickerdoodles! 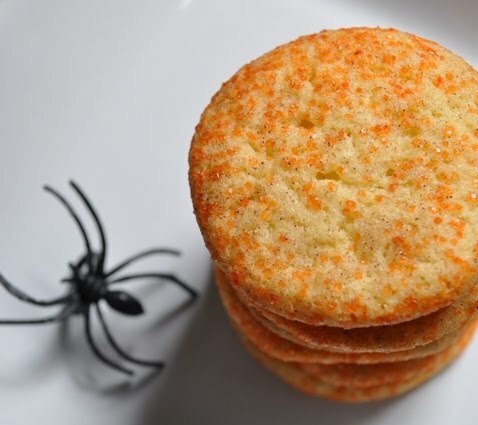 I love snickerdoodles and thought they would make a perfect Halloween treat for my nieces, nephews and little second cousins. 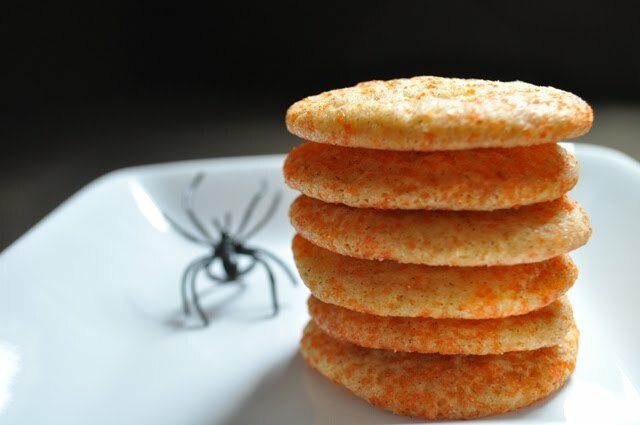 A little decorative orange sugar and they were instantly Halloweenized (new word!). The snickerdoodles turned out great! Chewy in the center and a touch crisp on the outside. But be very, very careful to not over bake them. A minute makes a big difference! Snickerdoodles are meant to be chewy, not crunchy! 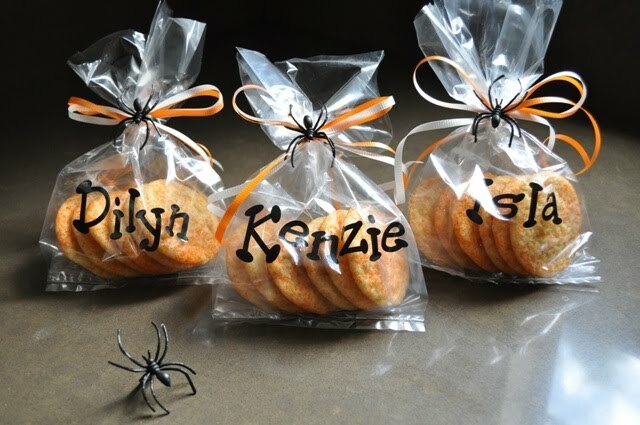 I packaged the snickerdoodles in clear plastic goodie bags, added each child's name on the outside of the bag using decorative black alphabet stickers, closed the bag with a twist tie, tied the bag off using orange and white curling ribbon and the finishing touch was a creepy black spider ring tucked in around the bow. 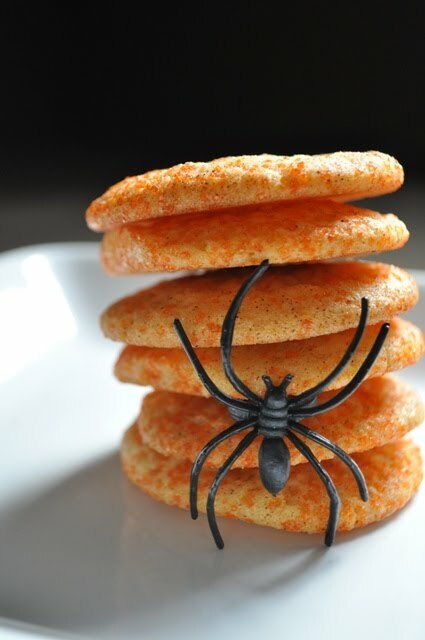 The cookies were a big hit with the kids and so were the spider rings. For the recipe click here. If you want to add colored sugar simply add the desired amount to the cinnamon sugar mixture called for in the recipe. I added several tablespoons (3-4) of orange decorative sugar. The cookies have that cinnamon snickerdoodle taste with a splash of color! So cute! This was one of my first recipes with SMS and remember them being delicious! These are so cute! I love the bags with the spiders!!! I haven't made this recipe and i love snickerdoodles, so I need to make it soon! Happy Halloween. How did you get them to look so light. They look like they are going to float away. 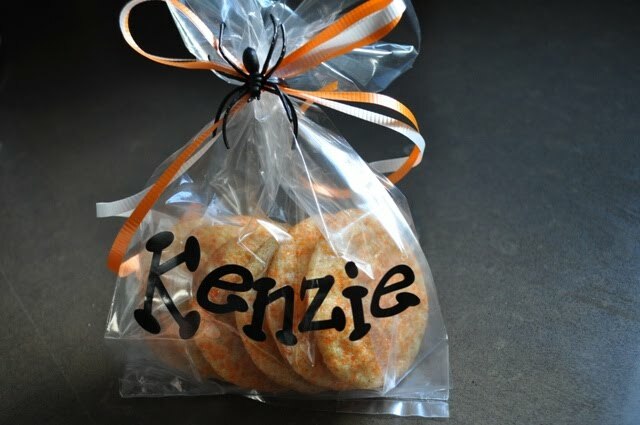 I love Snickerdoodles and these look delicious. Oh ur snicker doodles look perfect , i love everything about them rite from the name to the texture!! plan to make these for thanksgiving! How Halloween fun! 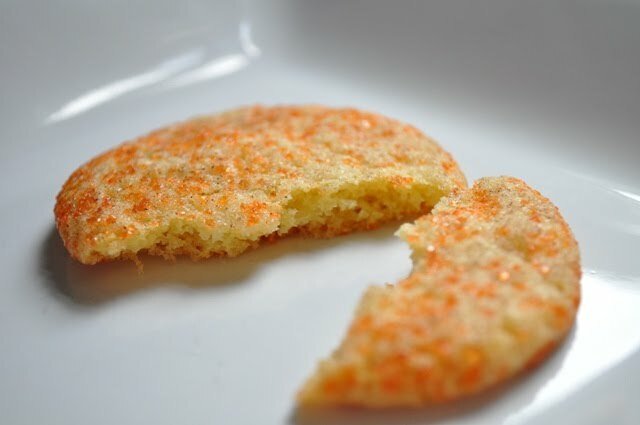 The snickerdoodles look picture perfect with the orange sugar sprinkles and cinnamon. Definitely chewy in the middle too, YUM! Thank you for your wonderful comments. Love my new job! =) Happy Halloween! Your snickerdoodles look absolutely perfect. I made these earlier this year and really really loved them. Such an easy recipe and so delicious as well. And your orange sugar looks quite festive. I love your photos! Great packaging! Sorry to hear savory muffins aren't "you thing" :) Your Snickledoodles are super cute and the packaging looks awesome! Love those letters and of course the little spider. Lucky kids!